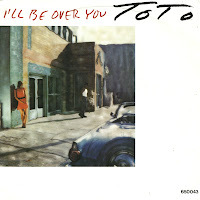 I first heard 'I'll be over you' as a bonus track on Toto's cd-single 'Stop loving you', released in 1987. It was years later until I found out that it was actually a track on their 1986 album 'Fahrenheit', and released as a single in its own right. 'I'll be over you' reached number 31 in the Dutch Top 40, but failed to chart in other territories. It features backing vocals by Michael McDonald - a very recognisable voice. 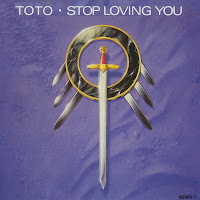 'Stop loving you' was the first single taken from Toto's 1988 album 'The seventh one'. The song was written by David Paich and Steve Lukather and featured backing vocals by Jon Anderson. The single peaked at number 2 in the Dutch Top 40. Toto's Steve Lukather commented in 2003: 'I didn’t think it was very good. That tells you what can happen when we pick our own singles!' Indeed, for 'Africa' became Toto's biggest hit ever. Taken from their 1982 album 'Toto IV', the single scored number1 in the Billboard Hot 100 chart, number 2 in the Dutch Top 40 and number 3 in the UK singles chart. 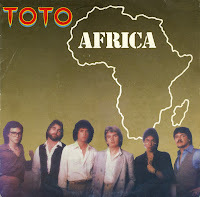 'Africa' was almost omitted from the album prior to its release. Having spent a great amount of time producing the tune, the band became so tired of the song that they didn’t want it on the album. 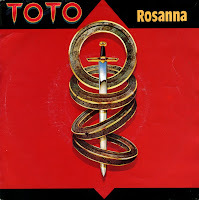 The song itself was very different from anything the band had done before, and some members felt that it didn’t sound like Toto. 'Rosanna' may well be one of the era-defining tracks of the Eighties. The instantly recognisable Toto track was written by the band's primary songwriter, David Paich. Many people think the song is about Rosanna Arquette, who at the time had a troublesome relationship with band member Steve Porcaro. The title was actually just coincidential: Paich needed a name to fit well into the chorus. The single peaked at number 2 in the US Billboard Hot 100 chart, number 3 in the Dutch Top 40 and number 12 in the UK singles chart. 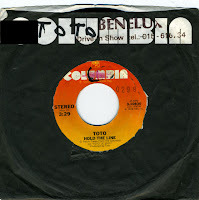 Toto's debut single was the 1978 track 'Hold the line', taken from their self-titled debut album. The song peaked at number 5 in the US Billboard Hot 100 chart, number 14 in the UK singles chart and number 25 in the Dutch Top 40. My copy of the single is a bit tattered and torn, and comes in a standard Columbia sleeve. Although I have seen copies with a picture sleeve later on, I never felt the desire to replace the original copy I bought - even though the song is one of my favourite rock tracks ever.